Calendula might be the sunniest little flower in the garden (well, maybe apart from Sunflowers). When it starts blooming, that vibrant, eye-catching color is noticeable from the next street over and the pollinators love it. My plants are always buzzing with happy little critters flitting about and spinning webs. The Calendula bed is a lively, cheerful spot to spend a morning reading or just breathing in the spring air. When my Calendula starts blooming, it goes to town quickly. Have your harvesting baskets ready, because you’ll probably be able to gather quite a few flowers each day while still leaving enough to feed the pollinators. When your drying racks are full of flowers and you’re wondering what to do with some of them, here are some ideas. 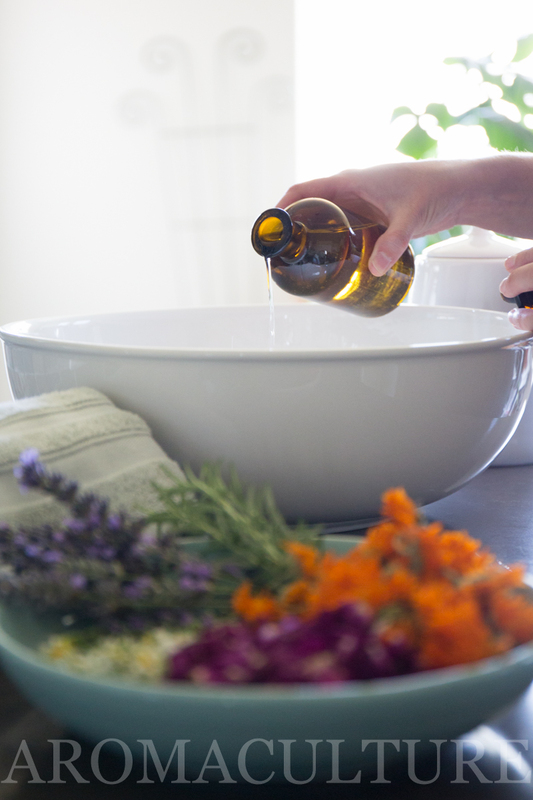 Calendula infused oil is one of the most versatile carriers to keep in your apothecary. It’s great for virtually every kind of skin issue and is wonderful in moisturizing recipes during those gray wintery days and the dry heat of the summer. 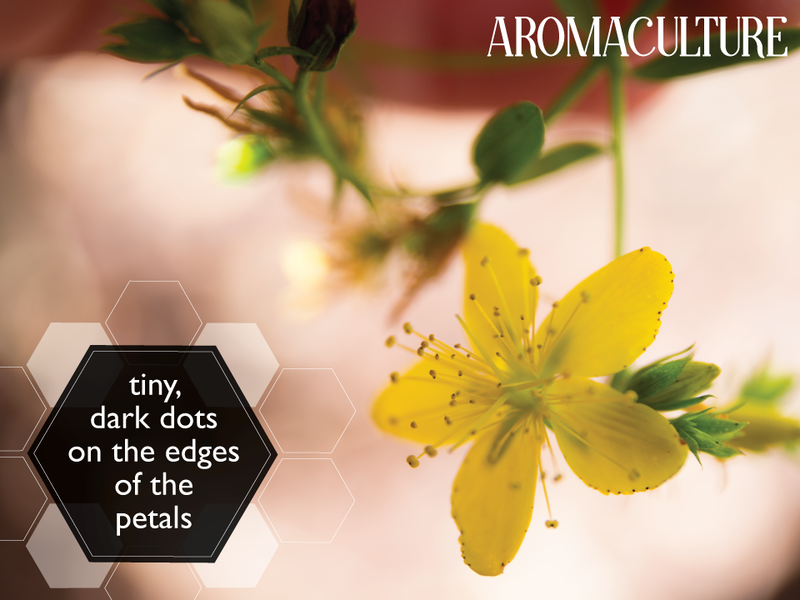 Use it to make salves, balms, lotions and creams, serums and body oils. If I had to choose only 5 oils to keep for my apothecary each year, Calendula infused oil would be at the top of the list. 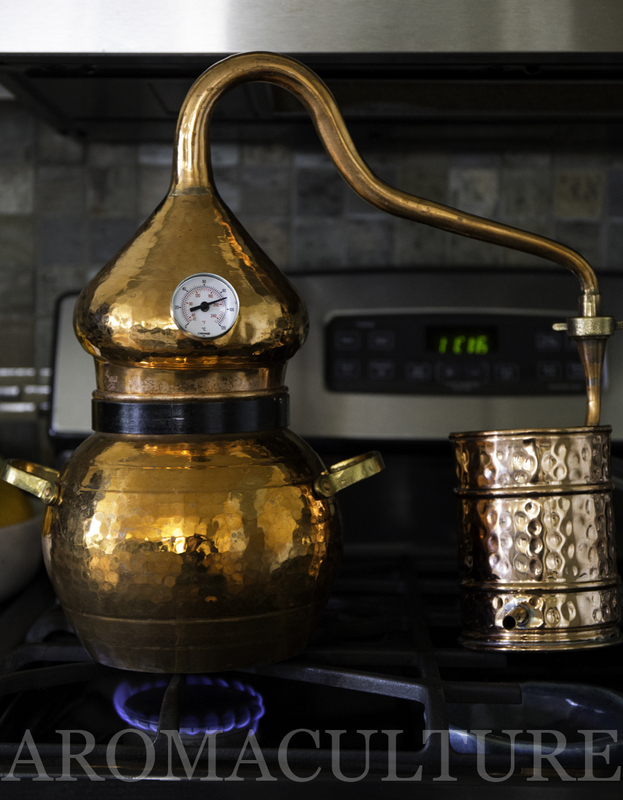 You don’t have to have a fancy still to make hydrosol. You can make it with just a stock pot, a large bowl (or even a wok), a steaming rack, a Pyrex measuring bowl, and some plant material. There are plenty of tutorials available online, but let me just say that the process is simple, non-intimidating, and easy and by the time you’re finished, you’ll have some beautiful Calendula hydrosol that you can use as a facial toner or as an ingredient in lotions and creams! 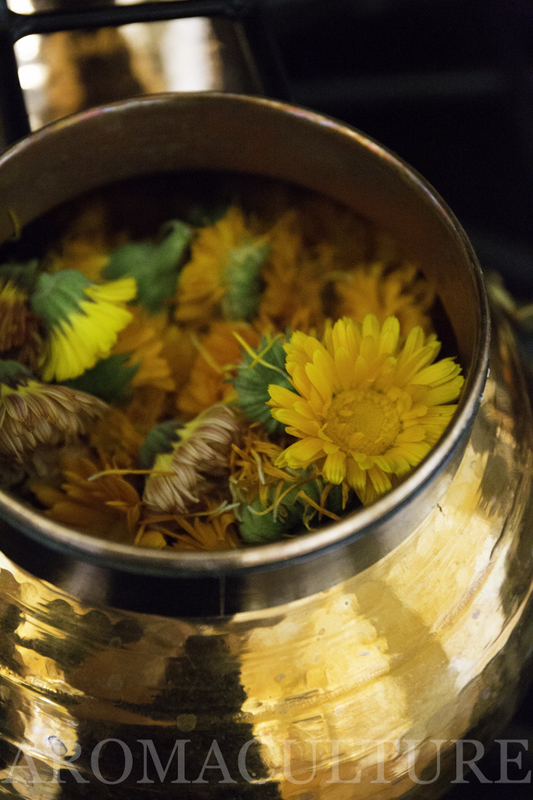 I love to add Calendula to my facial steam blends. 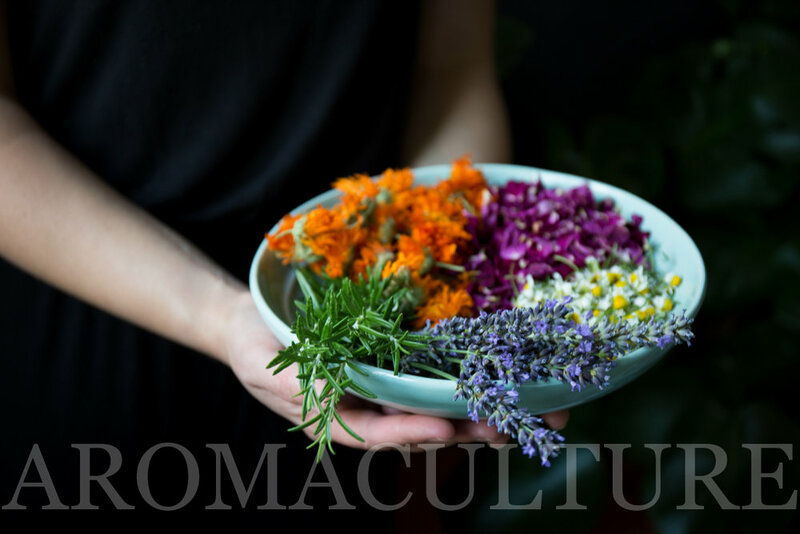 I pair it with other herbs based on what my skin needs at the moment, but one popular mixture I use a lot includes Rose petals, Lavender buds, Chamomile flowers and Rosemary leaves. Steep the herb mixture, covered, in a bowl as a strong tea, then allow the steam from the bowl to open your pores. Your skin will thank you! We like hand and foot baths around here. Maurice Messegue’s books were some of the first herbal books that I ever read and ever since then, I’ve been in love with this herbal application method. It’s so relaxing, but I also get to reap the benefits of all the beautiful herbs that I use. 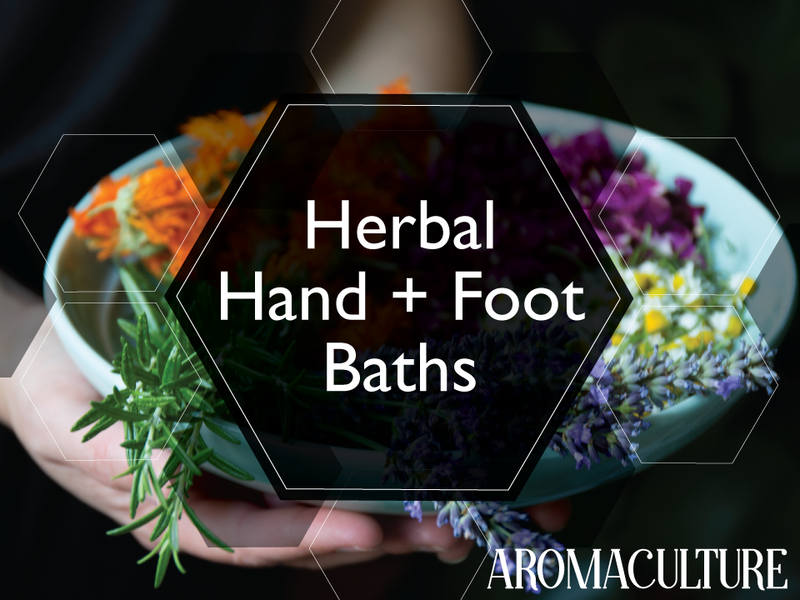 Calendula almost always makes it into my hand and foot bath recipes. Steep the herbs you choose as a strong tea, then pour the whole bowl into a basin or tub large enough to cover your hands or feet past the ankle/wrist joints. Add enough hot/warm water to the basin to cover your ankles/wrists, then sit back and relax for at least 8-10 minutes. I like to keep a hand towel near me, so I can easily dry off when I’m done. A bottle of moisturizing lotion and a pair of cozy socks turn it into a luxurious skin treatment as well. Calendula lip balm is perfect for soothing chapped or irritated lips. 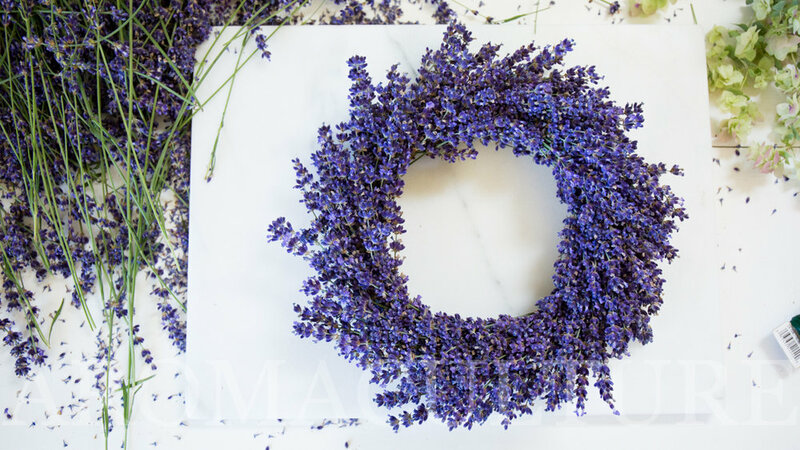 Infuse your carrier oil of choice with the dried flowers for 4-6 weeks, then add a bit of beeswax and Cocoa butter, pour into tins or tubes, and you have a skin-nourishing balm ready to apply. Tip: Use wider tubes to make an easy-to-apply version for other skin irritation issues like bites and stings. When I know I’m going to be spending the day in the sun, I like to whip up a 0.5 to 1 ounce spray bottle of skin-soothing spray to take with me. I usually use Aloe vera juice or gel (the kind you get from the nutrition section of the store that is meant for internal use) as my base and allow dried Calendula flowers to infuse in the Aloe while I’m getting ready. Strain, pour into a spray bottle, and take it with you on your day trip to have a ready-to-use after sun spray. Note: Because this is an Aloe-based product, it has a very short shelf life. It may last 2 or 3 days in the fridge, but shouldn’t used after that. It’s best to make a fresh batch whenever you need it. Nothing looks quite as sunny on your salad, shortbread or biscuits as fresh Calendula petals! Sprinkle them in generously to enjoy their peppery flavor. How do you like to use your Calendula flowers?